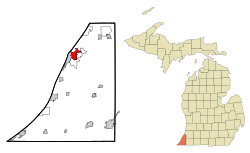 Benton Harbor is a city in Berrien County in the U.S. state of Michigan which is located west of Kalamazoo, and northwest of South Bend, Indiana. In 2010, the population was 10,038 according to the census. It is the smaller, by population, of the two principal cities in the Niles–Benton Harbor Metropolitan Statistical Area, an area with 156,813 people. 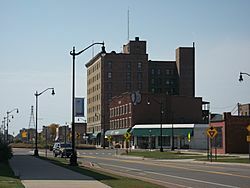 Benton Harbor and the city of St. Joseph are separated by the St. Joseph River and are known locally as the "Twin Cities". Fairplain and Benton Heights are unincorporated areas adjacent to Benton Harbor. Benton Harbor was founded by Henry C. Morton, Sterne Brunson and Charles Hull, who all now have or have had schools named after them. Benton Harbor was mainly swampland bordered by the Paw Paw River, through which a canal was built, hence the "harbor" in the city's name. In 1860, the village was laid out by Brunson, Morton, Hull and others, and given the name of Brunson Harbor. Brunson, Morton, and Hull also donated land and solicited subscriptions for construction of the canal, which was completed in 1862. It had long been recognized that a canal would be crucial to the town's development, both to drain the marsh and to provide a berthing area for ships. The canal, originally 25 feet (7.6 m) in width but expanded to 50 feet (15 m) in 1868, led to the town's becoming a shipping and manufacturing center for the area. In 1865, the name of the settlement was changed to Benton Harbor in honor of Thomas Hart Benton, a Missouri Senator who helped Michigan achieve statehood. In 1869, Benton Harbor was organized as a village and in 1891 was incorporated as a city. Two major riots occurred in 1966 and 2003. Several other riots have also occurred in the intervening period. According to the United States Census Bureau, the city has a total area of 4.68 square miles (12.12 km2), of which 4.43 square miles (11.47 km2) is land and 0.25 square miles (0.65 km2) is water. Benton Harbor has a humid continental climate (Köppen: Dfb) that has very warm summers for the type and also less cold winters than many climates of the classification. Due to lake-effect snow there is very high snowfall relative to precipitation in winter, but far lower than some locations that are farther north in the state. Summer high temperatures range from 77 to 83 °F (25 to 28 °C) from June to August, but the apparent heat is normally moderated by mild nights. The demographics of Benton Harbor contrast sharply with those across the river in St. Joseph. As of the census of 2010, there were 10,038 people, 3,548 households, and 2,335 families residing in the city. The population density was 2,265.9 inhabitants per square mile (874.9/km2). There were 4,329 housing units at an average density of 977.2 per square mile (377.3/km2). The racial makeup of the city was 7.0% White, 89.2% African American, 0.3% Native American, 0.1% Asian, 0.8% from other races, and 2.6% from two or more races. Hispanic or Latino of any race were 2.2% of the population. There were 3,548 households of which 44.3% had children under the age of 18 living with them, 17.0% were married couples living together, 43.2% had a female householder with no husband present, 5.6% had a male householder with no wife present, and 34.2% were non-families. 28.6% of all households were made up of individuals and 6.9% had someone living alone who was 65 years of age or older. The average household size was 2.77 and the average family size was 3.41. The median age in the city was 28.3 years. 35.1% of residents were under the age of 18; 10.4% were between the ages of 18 and 24; 24.5% were from 25 to 44; 22.2% were from 45 to 64; and 7.7% were 65 years of age or older. The gender makeup of the city was 46.5% male and 53.5% female. At the 2000 census, there were 11,182 people, 3,767 households and 2,557 families residing in the city. The population density was 2,545.7 per square mile (983.5/km²). There were 4,492 housing units at an average density of 1,022.7 per square mile (395.1/km²). The racial makeup of the city was 92.40% African American, 5.48% White, 0.15% Native American, 0.13% Asian, 0.04% Pacific Islander, 0.14% from other races, and 1.65% from two or more races. Hispanic or Latino of any race were 0.58% of the population. There were 3,767 households of which 42.0% had children under the age of 18 living with them, 20.8% were married couples living together, 42.0% had a female householder with no husband present, and 32.1% were non-families. 26.6% of all households were made up of individuals and 8.2% had someone living alone who was 65 years of age or older. The average household size was 2.91 and the average family size was 3.53. Age distribution was 39.6% under the age of 18, 9.8% from 18 to 24, 25.9% from 25 to 44, 16.5% from 45 to 64, and 8.2% who were 65 years of age or older. The median age was 25 years. For every 100 females there were 83.3 males. For every 100 females age 18 and over, there were 72.7 males. The median household income was $17,471, and the median family income was $19,250. Males had a median income of $27,154 versus $20,105 for females. The per capita income for the city was $8,965, the lowest in Michigan. About 39.6% of families and 42.6% of the population were below the poverty line, including 52.5% of those under age 18 and 29.7% of those age 65 or over. Black Autonomy Network Community Organization (BANCO) is a political and social justice coalition working in Benton Harbor. I-94 bypasses the city to the east and south, connecting with Kalamazoo and Detroit to the east and with Michigan City, Indiana, and Chicago, Illinois, to the south and southwest. BL I-94 travels through the downtowns of both Benton Harbor and St. Joseph. It mostly follows the former route of US 12. I-196 begins nearby in Benton Township and continues northerly toward Holland, ending at Grand Rapids. US 31 is currently a freeway (the St. Joseph Valley Parkway) from the Indiana border north, until merging with a five-lane road (Napier Avenue) to a brief connection with I-94. A freeway connection directly to I-94 is planned. M-63 serves as a loop route connecting with I-196 at the north and running through downtown St. Joseph. M-63 continues on to I-94 and then to M-139, where it ends. M-63 follows the former route of US 33. M-139 begins at US 12 near Niles and terminates at BL I-94 on the Benton Harbor–Benton Township border (the northbound direction terminates wholly within Benton Township). M-139 follows a former route of US 31 south of I-94. Spanning the Paw Paw River and providing an additional connection to St. Joseph, the Charles Freeman Joseph bridge on Whitwam Drive, is named for Benton Harbor's first black mayor, opened in late 2005. The Amtrak station in St Joseph is served daily by Amtrak's Pere Marquette passenger train. Twin Cities Area Transportation Authority (TCATA) provides bus transit throughout Benton Harbor and the surrounding areas. Originally strictly a dial-a-ride service, it has recently expanded to include three fixed routes—Red Route, Green Route and Blue Route. Red Route serves Benton Harbor, St. Joseph, St. Joseph Charter Township, Lincoln Township, and Royalton Township. Blue and Green routes operate throughout Benton Harbor and Benton Township. Southwest Michigan Regional Airport provides non-commercial air service. Both Benton Harbor and neighboring St. Joseph are commercial ports that receive bulk goods from lake freighters. Sites of interest in Benton Harbor are Shiloh House, built in 1910, which served as the administration building and men's dormitory for the House of David colony, a communal religious group; Morton House (on Morton Hill), built in 1849 by Eleazar Morton, which now houses a museum; Jean Klock Park on Lake Michigan; and the Golf Club at Harbor Shores. In neighboring Benton Township is a large fruit market which replaced the prior fruit market located in the "flats" area of Benton Harbor, which was torn down during an urban renewal project in 1967. The main shopping center is The Orchards Mall. Benton Harbor is cohost of the annual Blossomtime Festival with St. Joseph. Benton Harbor, Michigan Facts for Kids. Kiddle Encyclopedia.